A two-pronged strategy of reducing imports and increasing exports are vital for decreasing the large trade deficit, achieving a balance of payments surplus and strengthening external finances. Nevertheless, the immediate reduction of imports is critical for containing the trade deficit this year. While increasing exports significantly is the medium-to-long-term strategy, containing imports is the short term solution. However, the character and the composition of the country’s import dependency make this a difficult and challenging task. Although the country’s import and export structure has undergone significant changes, especially after liberalisation of the economy in 1977, the country remains highly import dependent. It is owing to this that the country has had persistent trade deficits in most years. Reducing imports is difficult as they are mostly essential consumer items or intermediate inputs for production. 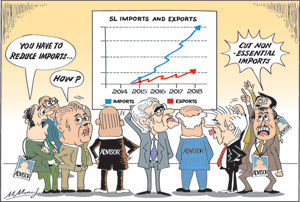 Sri Lanka’s economy has been an export-import dependent economy for more than 150 years. Although there have been significant changes in the composition of imports and exports in the last four decades, the economy remains a highly import-dependent one. From the 1950s till the 1970s, the country’s exports were mainly agricultural crops: tea, rubber and coconut. This changed significantly after the liberalisation of the economy and the setting up of export manufacturing industries. While, in 1977, agricultural exports constituted 79.3 percent of exports and manufactured exports accounted for only 14.2 percent of total exports, by the turn of the century, manufactured exports increased to around 60 percent and agricultural exports declined to about 40 percent. Garments, ceramics and rubber goods exports expanded significantly. Garments exports replaced tea as the country’s main export. In 2018, industrial goods accounted for 70 percent of exports and agricultural products for 30 percent. In spite of this drastic reversal, the country’s high import dependency persists, though of a different nature. Even though the import composition changed significantly, import dependency is high. Food imports declined with increased production of rice and other food crops, but several basic food items such as wheat, sugar, milk and dhal continue to be imported. Food imports amounted to about 10 percent of total imports in recent years. On the other hand, imports of fuel and intermediate goods increased. In 2018, consumer items accounted for 22.4 percent of total imports, with food imports constituting 10.3 percent. The most significant change was the import of higher amount of intermediate goods. With industrialization, the imports of raw material such as textiles and chemicals increased. The fuel import bill also increased owing to higher needs of fuel for thermal generation of electricity and increased needs for transport and industrial uses. Consequently, fuel constituted 18.6 percent of total imports in 2018. Total imports increased by 6 percent from US$ 21 billion in 2017 to US$ 22.2 billion in 2018. This significant increase of imports has been the main cause of the widening trade deficit from US$ 7 billion in 2016 to US$ 9.6 billion in 2017 and US$ 10.3 billion in 2018. This increase in the trade deficit to US$ 10.3 billion last year is far too high and must be reduced this year. Import dependency is inevitable for a small country with a narrow resource base. Most exports have a high import content. Even tyre manufacture has a large import content, as canvas, steel, chemicals and synthetic rubber are needed. It is more so with respect of the country’s main manufactured export-garments. Textiles, thread, machines and even buttons are imported. This is clear by the fact that while garments exports amounted to US$ 3 billion in 2018, textile imports were US$ 2.8 billion. For this reason, much of the intermediate imports of US$ 4 billion are for manufactured exports and some of the intermediate imports like fertilizer, fuel and chemicals that are for agricultural and industrial production. In this import composition, are there non-essential imports that could be curtailed? In recent years, there have been significant imports of vehicles and gold. In 2018, vehicle imports cost US$ 1.6 billion, while gold imports amounted to US$ 0.6 billion in 2017 and 0.4 billion in 2018. These two items amounted to about 10 percent of total imports in 2018. Can the nation fritter away its scarce foreign exchange on these imports? The Central Bank points out that these imports have declined in December 2018. This is a case of shutting the stable doors after the horses have bolted. One of the serious deficiencies in policy making is that decisions are taken without due consideration to their impact on the trade balance and external finances. For instance, import tariffs are often based on considerations of enhancing revenue without considering their impact on increased import expenditure. Again, decisions are taken to reduce tariffs to gain popularity. This has happened in the case of car imports where tariffs have been reduced as a popular measure without considering its consequence of an increase in import expenditure. Furthermore in determining monetary policy, the Government should consider their impact on increasing the aggregate demand that leaks and increases imports. 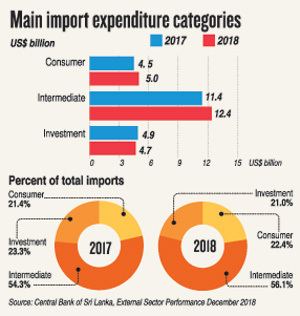 Without a comprehensive strategy that is conscious of the need to contain import demand, the trade balance will have a large deficit that is detrimental for the external finances of the country. The larger the trade deficit, the lesser the likelihood of a significant balance of payments surplus. In 2018, the trade deficit of US$ 10.3 billion was offset by workers remittances of US$ 6.7 billion and tourist earnings of US$ 4.1 billion – a total of US$ 10.8 billion. This, together with other income, resulted in only a small BOP surplus of US$ 1.4 billion. Had the trade deficit been around US$ 8.5 billion, then the BOP surplus on the current account would have been about US$ 3 billion. This underscores the importance of reducing the trade deficit. A lower trade deficit is imperative to achieve a balance of payments surplus to reduce the country’s external financial vulnerability as further foreign borrowing at high cost for foreign debt servicing would weakens the external finances and drive the country into a foreign debt trap. If the trade deficit is not contained to achieve a significant balance of payments surplus, foreign borrowing is needed to meet foreign debt obligations and finance development expenditure. Further foreign borrowing would increase the currently large foreign debt and enhance the country’s external financial vulnerability. The reduction of the trade deficit is imperative to reduce the country’s external vulnerability.